On the frantic battlefields of Fortnite, you’ve probably seen a few royalers sporting golf clubs, or shooting hoops to pass the time. Maybe you’ve even taken a few L’s yourself on the game’s new, expansive golf course. Well, if you’re wondering how that all works, here’s a quick guide to mastering the minigames that these toys let you indulge in. If you don’t quite know how to get them, don’t fear - they’re buried in the Battle Pass menu. 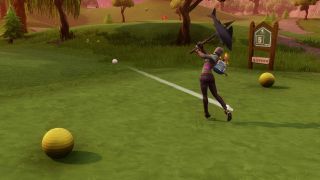 These “toys” are the beach ball, basketball, and golf ball, introduced at the start of Fortnite Season 5 back in July. To unlock them, you have to buy a Battle Pass and level your way through tier after tier of rewards to finally get your hands on them. You better get cracking, though - you unlock the basketball at tier 11, the golf ball at tier 27, and the beach ball at tier 43. If you keep going, you'll also unlock fancy versions of the golf ball at tier 59, beach ball at tier 75, and the basketball at tier 91. Once you actually get these toys, you’ll probably want to go about equipping them. They’re treated as emotes, so just use the wheel like you would with any of the game’s wonderful, lively dances. Use the B key or down on the d-pad to bring up the wheel, if you don’t remember. For the beach ball, there isn’t really much to do other than try to keep it up in the air. Jumping against it gives it a little more momentum, as does whacking it with your Harvesting Tool. You can try this at the tennis court near Lazy Links for maximum effect. Once it hits the ground, it’s only a matter of time before it disappears. While Season 5 is nearly finished, chances are the next Battle Pass will feature new versions of each toy so no one is left out. Check near Retail Row, Greasy Grove, and Tilted Towers amongst other locations for Fortnite basketball courts. You can try to do your best Kobe impression there. Make sure sure to aim your reticle such that you get a good arc on your shot; if you manage to get it in the hoop, it’ll show up on the kill feed. Just watch your back - some griefers like to set up in these locations, waiting for easy marks like yourself. The golf ball is a little easier to figure out. If you look on your map, you’ll find Lazy Links in the north of the map, in the dead center. Look around there enough, and you’ll find a nine-hole golf course for you and your friends to mess around with. Like the basketball, the position of your reticle will have a significant effect on the path of the ball, so make sure to fine-tune it before you hit the links for real. As with the basketball, you might find some people camping this location, fully intent on ruining your fun, so stick to the Fortnite Playground mode if you’re absolutely determined to play an actual round.